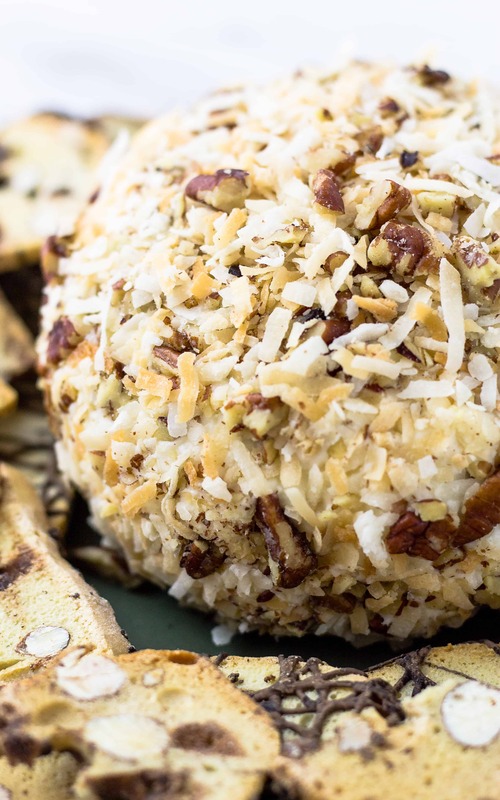 The classic cake full of coconut, pecans, and cream cheese is now a cheese ball! My Italian Cream Cake Cheese Ball is dessert and the perfect party food too! I’m not sure if you have heard of an Italian Cream Cake before this post or not, but I will say that it is not what you expect. My family owned an Italian restaurant that they purchased from “Tony the Greek” when I was younger as you might have read in my post for Kathy’s World Famous Garlic Knots, but until I went away to college in Tennessee did I see or hear about an Italian Cream Cake. Imagine seeing an Italian Cream Cake in the bakery department in the local Kroger’s food store?!?! In Tennessee! Being that I love Italian food, I jumped at the chance to try it, bought the whole cake, and took it back to my dorm poised and ready with a disposable fork. Just take me to the Italian Cream Cake Cheese Ball Recipe Already! If you’d rather skip my (very helpful, I think) tips and tricks, essential cooking info, and similar recipe ideas – and get straight to this delicious easy Italian Cream Cake Cheese Ball recipe – simply scroll to the bottom of the page where you can find the printable recipe card. What is an Italian Cream Cake? The Italian Cream Cake I purchase was basically a yellow cake with pecans and coconut added to it and covered with a cream cheese frosting that is studded with coconut and pecans. What about coconut and pecans sounds Italian? What is the old-fashioned Italian Cream Cake recipe? Come to find out it is really a Southern made dessert and someone slapped the name Italian Cream Cake on it. What a disappointment to my Italian loving ears but was it really the original “click-bait” that everyone is using now to get you to buy it/taste it/make it? I certainly bought the cake out of curiosity. Luckily for me, I love pecans and coconut. Oh, and cream cheese frosting! Italian Cream Cake is amazing because the pecans and coconut make an incredible combination! Do you know what else is an incredible combination? Cheese balls and sweets. A sweet cheese ball? As I have stated before, Cheese Balls are the perfect party food! I totally love a cheese ball and some crackers to shovel it in my mouth with. 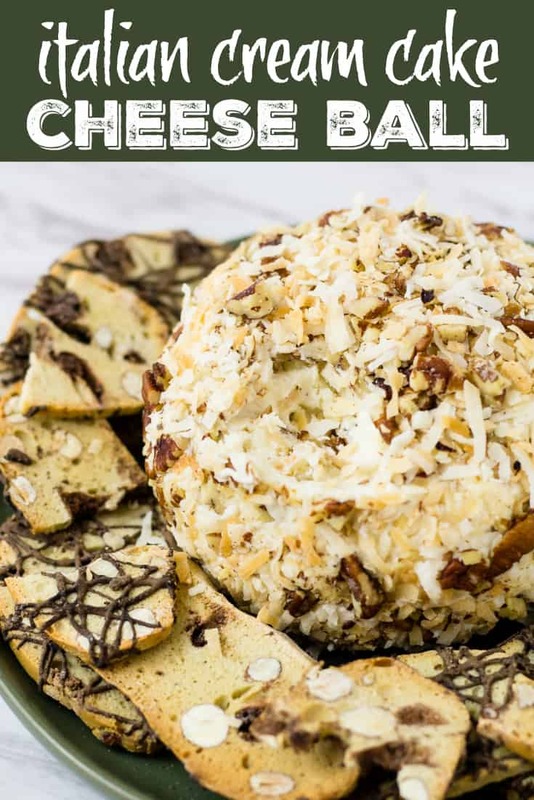 How about instead of all the savory cheese balls out there, a dessert cheese ball that makes me seem like I am eating a “decent” meal and dessert at the same time?!?! This gave me the idea for a dessert cheese ball with all the benefits of an Italian Cream Cake. Enter the easy Italian Cream Cake, a Cheese Ball!! I serve my Italian Cream Cake Cheese Ball with cookies and cookie sticks. My favorites ones are these Thin Biscotti Cookies. There are a ton of different flavors but nothing beats the Double Dark Chocolate Almond ones! The chocolate goes so well with the Italian Cream Cake flavors. I also love serving this with Cinnamon Graham Cracker Sticks. They make chocolate ones too. 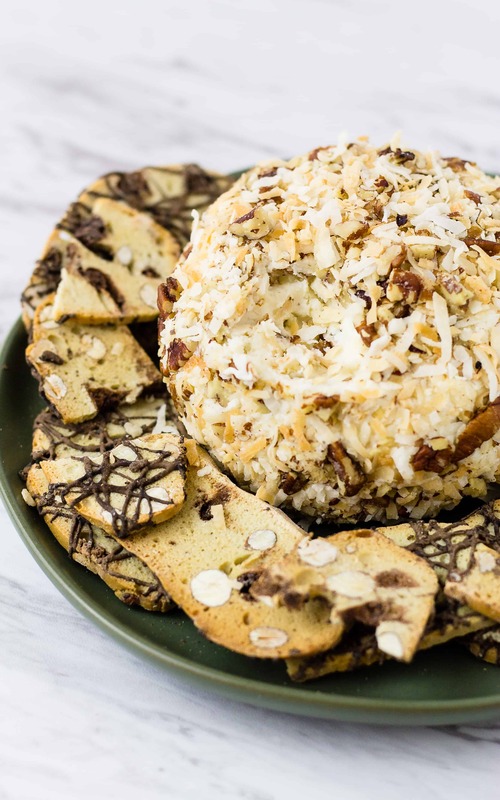 Even though this Italian Cream Cake Cheese Ball is desserty in nature, feel free to serve it at the beginning of your party and skip right to the fun parts! 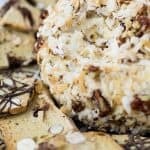 Other great Sweet Cheese Ball recipes to try! If you love this Italian Cream Cake Cheese Ball Recipe as much as I do, please write a five-star review in the comment section below (or on Pinterest with the “tried it” button – you can now add pictures into reviews, too! ), and be sure to help me share on facebook! 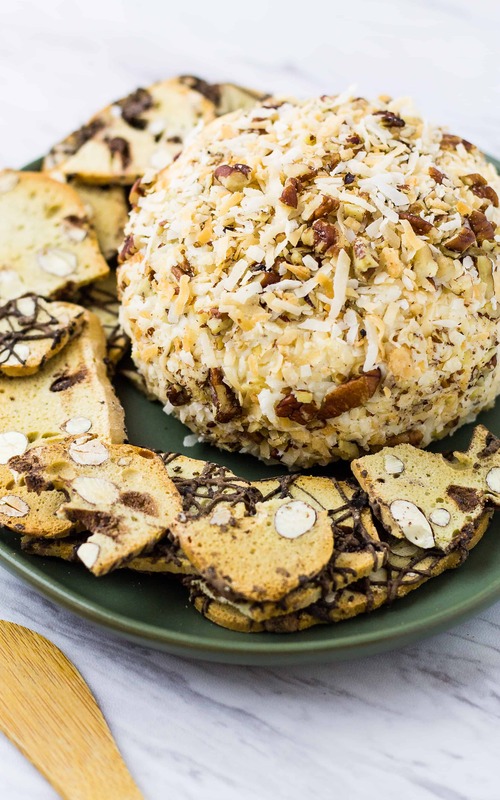 Where will you serve this Italian Cream Cake Cheese Ball? Mix the cream cheese, powdered sugar, vanilla, and half the pecans and half the coconut together in a bowl. Mix the remaining coconut and pecans together and place on a plate or shallow bowl. Roll the Italian Cream Cake Cheese Ball in the mixed pecans and coconut to coat the ball evenly. Wrap in plastic wrap and store in the refrigerator until ready to serve. Serve with cracker sticks, cookies, but my favorite is the thin biscotti! What a great idea! I’m going to try making it so I can do one when guests come over. So excited. This sounds like such an awesome idea! 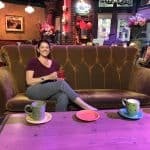 This sounds so up my alley! Ingenious ides!! 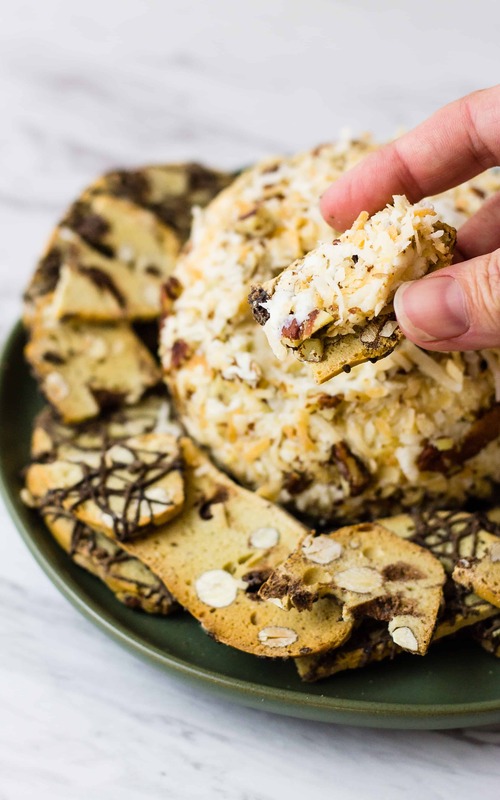 I love the cheeseball — serving it on those biscotti cookies? Over the top delicious! I keep seeing these sweet cheeseballs and have never attempted to serve on myself. This is going to change right now… this cheese ball has my name ALL over it! making my grocery list now! Yes, I would definitely buy this/make this/try this! 😀 What a fabulous dessert, creative and so fun for a party!! I love cheese balls for appetizers or desserts. They’re so creamy and delicious. I have to be careful or I’ll eat the WHOLE THING! You could put any name on that baby and I’d love it! Making a ball means I can have it as an appetizer and a dessert!